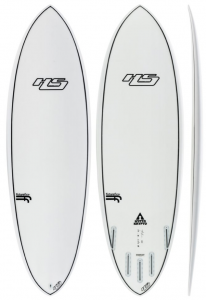 The Hypto Krypto V surfboard is a variation on the Hayden’s popular tri fin model, and while the shape remains the same, the 5-fin set up allows the board to be surfed as a quad or a thruster.Hayden adjusted the fin placement on the Hypto V to maximise the overall performance of the convertible set-up, while maintaining the smooth feel that’s become synonymous with this board. 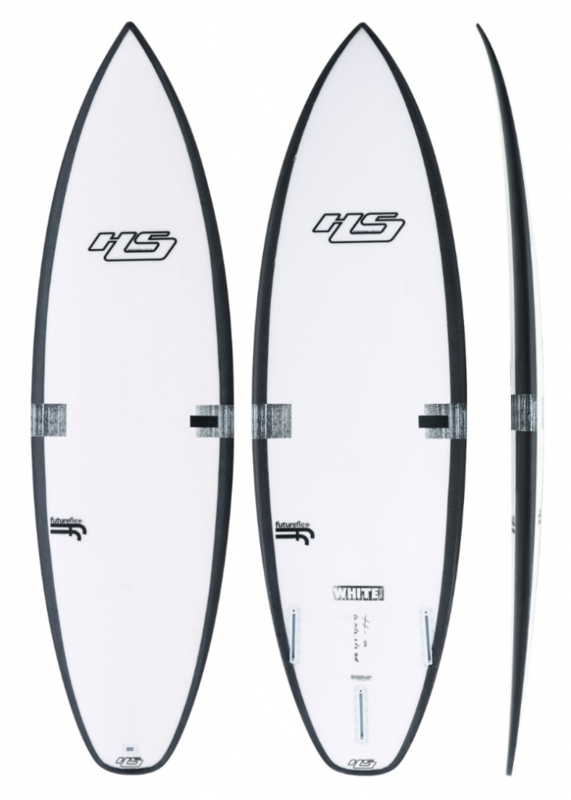 The rear fins are quite centralised, and Hayden recommends using the quad rear fin he developed with Futures to fully capitalise on the potential of this model.Compared to the tri fin, which surfs a little more freely and with nice pivot off the tail, the Hypto V offers a more connected feel to the wave face, with added forward drive and projection. The quad set-up will also feel very smooth down-the-line while encouraging a longer turn on the open face.The Hypto Krypto continues to be the most versatile shape in the Haydenshapes range, and the 5 fin set-up gives the rider even more options. 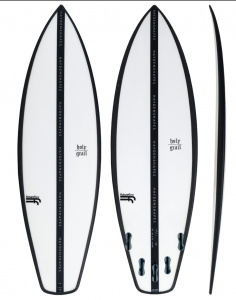 The outline resembles an old school twin fin in the nose, and when combined with a high amount of volume under the chest, enables it to paddle like a dream and support rider acceleration off the front foot.Through the back the outline pulls into a rounded pintail creating a lot of curve around the back foot. This not only provides plenty of hold in the bigger stuff, but also allows you to draw tighter arcs in the pocket. 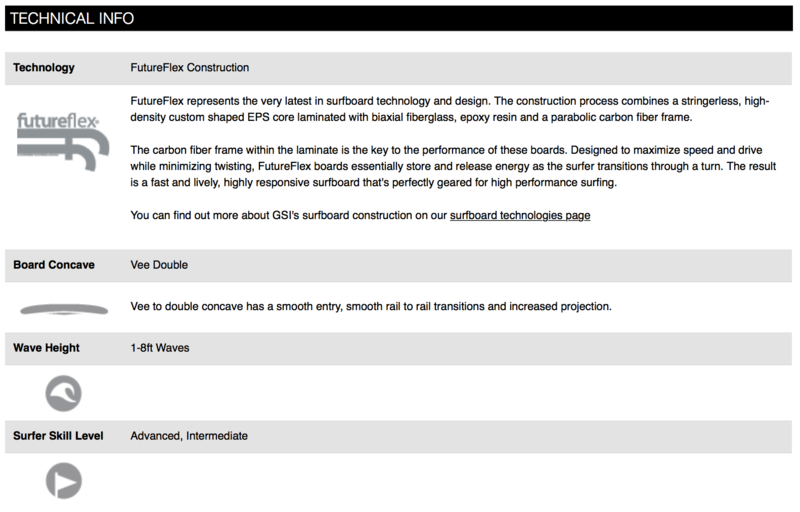 The foil also refines out to a thinner, pinched rail to keep the board connected to the wave.The design of the rocker, which is flat throughout with a little lift in the entry, is focused around speed, enabling surfers to make sections they don’t normally expect to make. The concave runs from a rolled vee in the entry to a slight single, blending into a vee double out the tail, which gives the board great speed and control from rail-to-rail. Whether you’re a front or back foot surfer, White Noiz has a very balanced feel. 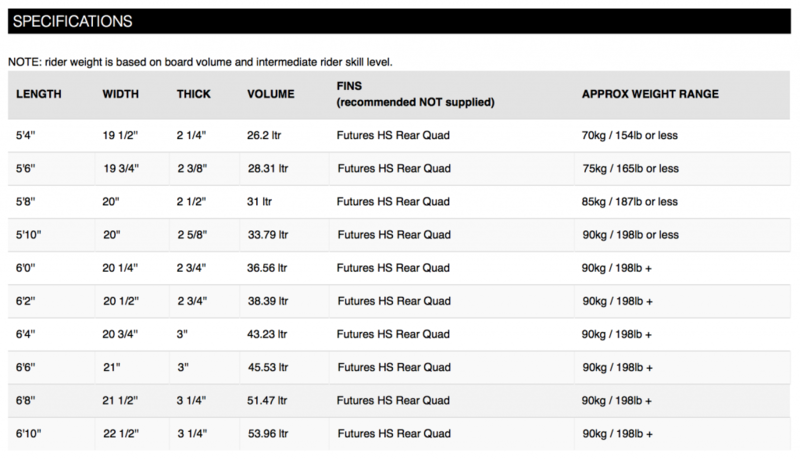 This model prefers to be ridden 1” – 2” shorter, and surfs best in waves from 1 – 4 feet, (waist to head and half high).